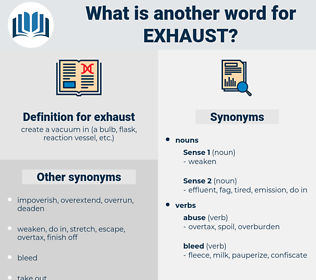 What is another word for exhaust? discharges, speeds, returns, releases, fumes. tailpipe, exhaust-gas, venting, flue, gas, escape. tailpipe, escapement, venting, gas, escape. revere, benefit, respect, care for, prize, esteem. charm, interest, please, excite, amuse. construct, not use, collect, store, neglect, accumulate, gather. emit, activate, eject, bolster, enforce, rebuild, disperse, disgorge, restore, vitalize, exude, cast out, radiate, augment, enlarge, energize, replace, distract, save, put forth, reinforce, renew, rest, conserve, send out, revive, relax, dissipate, fortify, give up, preserve, repair, vomit, unwind, rejuvenate. He moved the control to open a side exhaust and change their direction of fall. By the sound of your move across the room, and the stream of talk I heard above must be enough to exhaust any one. 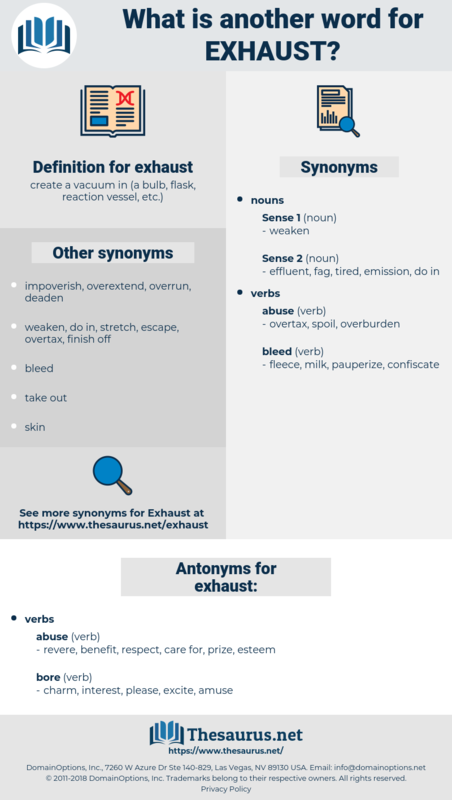 equid, exudate, executed, excite, excited, exit, eight-day, excogitate, exhausted, east, exhaust hood, execute, egest, eject, exactitude, exocet, essayist, eighty-two, eye socket, est, exist, escheat, esocidae, excused, eyeshadow, egghead, exact, exquisite, eased, Exsiccate, ect, exocoetidae, exude, equate, eke out, equisetatae, escudo, eighty, esthete, eyeshot, eyeshade, exceed, egg white, equity, estate, ezed, equidae, exode, eighth, Exegete, exacta, eightieth, echt, eyesight, each day, exiguity, egoist, eight. waste, waste matter, waste product, waste material, gas. jade, weary, tire, wear upon, wear out, wear down, wear, tire out, fatigue, outwear, fag out, fag.